'Iver Johnson Arms & Cycle Works' of Fitchburg, Massachusetts, was a leading American manufacturer of arms and cycles in its day. Their popularity in the 21st Century is due to their excellent advertisements, particularly for the Iver Johnson pistol with their famous safety hammer. The Iver Johnson truss-bridge design ran from 1909 until the early 1920s, and was very popular as it was well-priced and a well-made lightweight cycle. The 'motobike' versions (a pretend motorcycle for kids) had a pretend petrol tank under the crossbar. 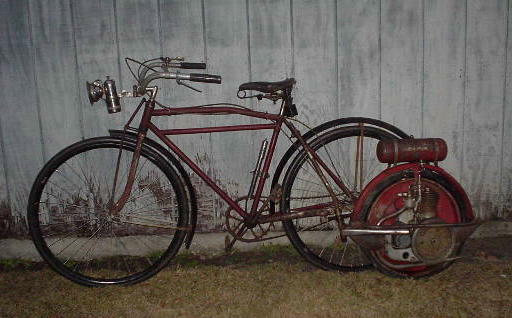 As bicycles became popular in the last decade of the century, C.J. Smith and Sons branched out. By 1895, it was the largest manufacturer of steel bicycle parts in the United States. The patriarch called in his eldest son, Arthur O. (A. O. ), an architectural engineer specializing in large buildings, to help build a five-story factory for the growing family business. After two years of close work with his father, A.O. decided to join the company permanently as treasurer. By then, C.J. Smith and Sons had declared itself the largest manufacturer of component bicycle parts in the world. 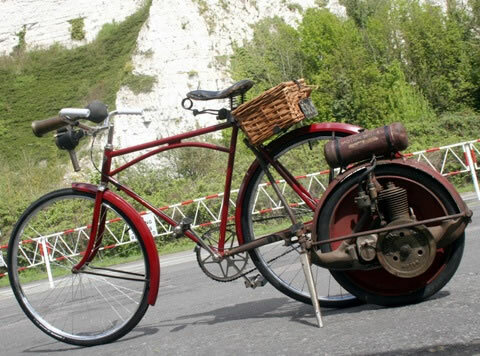 Iver Johnson Truss-bridge bicycle motivated by a Smith Motorwheel unit that is fitted alongside the rear wheel. Like other late 19th Century/ early 20th Century bicycles it is fixed pedal drive. There are no brakes!